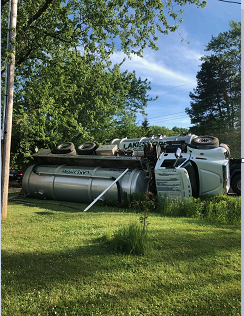 BOSTON -- A 33-year-old Orchard Park man was charged with driving while intoxicated after New York State Police responded to an overturned septic tank truck earlier today. According to NYSP, Troopers responded to the report of an overturned septic tank truck on Zimmerman Road, where investigation revealed Geoffrey Chandler drove the truck off the road and onto its side. There were no other passengers and nobody was hurt. The contents of the septic tank were not spilled and they were safely transferred to another truck. Police say Chandler failed SFSTs at the scene and provided a breath sample of .25 percent blood alcohol content. Chandler was released with a return court date in Boston court.